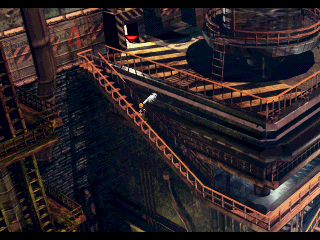 While far from the most challenging game of the series, Final Fantasy VII has its share of tricky moments, not least because of the confusing perspective of some of the pseudo-3D backgrounds. Never fear, though: our super players at CoN have spent many joyless hours logging their path through the game so that you, gentle reader, can avoid frustration. As you progress through the game, you will come across items that you can get only once — you won't want to miss these, so have a look at our Missable Items guide to make sure you get what you want. The opening sequence is a long FMV. You see flashes of the slums and the city, then the screen focuses on a young woman, carrying a basket of flowers. She stands up near a spray of green, then walks away. You then see a train, then Midgar from a distance. Once the train winds around, the FMV ends and goes into interactive mode. People jump off of the train, and then a large man (Barret) tells you to “Come on.” Be sure to click the Okay button on the knocked out, red-uniformed soldier to get a Potion before following. You'll notice quickly that Cancel (X) makes you run. Go to the other red-uniformed man to get another Potion, and head right. Go to the group of people, and talk to the one in the middle. This group of fighters is called AVALANCHE, and the enemy is SOLDIER, which you, Cloud, used to be a part of. Cloud, however, pledges allegiance to neither side. Turn right, then left, following Biggs. Tip: If you hit select during battle, you can see the name of the enemies that you're attacking. Go through the door to the bridge, then turn right with the others. Now you're in the reactor. Talk to Barret, and he joins your party. Talk to the one beside the panel, Biggs, then Jessie at the next one if you don't want to waste time with talk. Otherwise, talk to the other person first. Once in the elevator, go in front of the triangle shaped buttons, and press Okay. This next part can be hard to see, so check up the popup screenshot to the right (note that CoN will offer these popups in many instances throughout the walkthrough for your benefit!). Follow Jessie out of the elevator, and down the long stairwell on the side. You need to go all the way down. If you lose track, press Assist (select) to get arrows. You'll see a shiny blue object in the area with the golden metal poles. Pick it up, it's a Potion, then continue on down the ladders. Jessie will stay put. Keep going over a large pipe and you'll see the first save point after a moment. Continue down the long bridge pathway. Being the first boss, he’s not that difficult. Don’t attack him when his tail is up, because it makes him attack you for more damage than usual. However, if you’re quick enough with potions, this is a good way to get your limit breaks to become available. Both magical and physical attacks work well on him. You get an Assault Gun when you win, which you should quickly equip. You now have 10 minutes to leave the reactor. Take the same path first, and make sure that you talk to Jessie. After the elevator, talk to Jessie, then Biggs. You can easily get out with 4-5 minutes to spare, so don't worry about time. After you're out the door, you witness the lovely explosions as Wedge runs around in a panic.